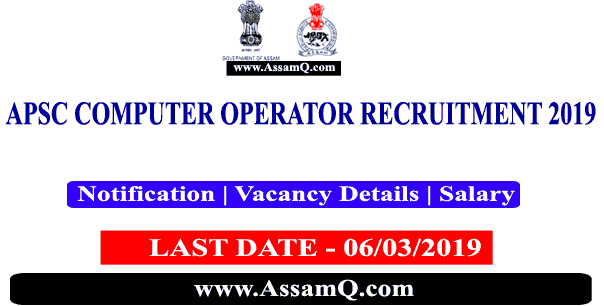 APSC Computer operator (CO) Examination 2019 - Aassam Public Service Commission has invited application from eligible candidates for filling up the vacancies of 90 Computer Operator Posts Vide Advertisement No. 01/2019 dated 02-03-2019. No. of Posts: 90 Nos. such as – i) Word Processor, ii) Spreadsheet, iii) Presentation Graphics, iv) Content of Database, v) Internet and vi) E-Mail. 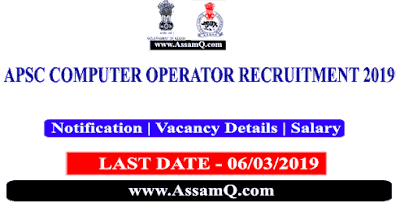 Remuneration: Pay Scale Rs.14,000/- to Rs.49,000/- with GP Rs.6,200/- plus other allowances as admissible under the rules.